I was browsing my list of blogs that I follow and I came across this fun idea on eighteen25. I love this blog, there is always something fun and crafty featured almost daily. 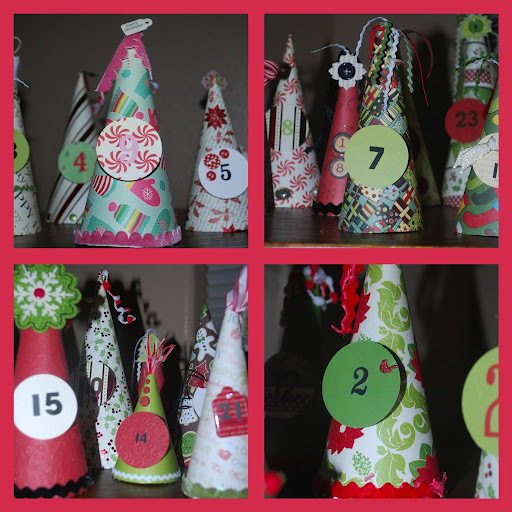 A few days ago they posted the Advent cone craft. I fell in love and knew I wanted to make these apart of my Christmas decor. I also knew Finley would enjoy helping and would enjoy finding the cone for each day and discovering a little treat underneath. I’m thinking Reeses or a sticker would be a fun treat for under them. Here is the how to. Finley, My mom and I all sat down one night in bed and got our scrapbooking paper and supplies out and went to work. We had a lot of fun. We added a lot more detail and embelishments to ours. I love the way they turned out. Super fun and super easy! Happy Holidays, have fun crafting. I will be making these beauties this weekend. I can’t wait.